I was wondering, do yukata's always have a repeating pattern or do they ever have a pattern like a Hōmongi kimono where there's a large image on the bottom, and accents of that image on the shoulder and sleeves. If a yukata was made this way, would it look like it's trying to imitate a kimono? Been baffled on this one, thanks in advance! Re: Yukata patterns always repeat? I can offer an example that says yes to one of your questions and no to the other. I have a yukata that has a lower-hem border, plus a larger patterned area over one sleeve and shoulder--the rest is white. Houmongi-style patterning can definitely be a thing. However, this yukata is classic indigo and white and it's made of some very light cotton that's impossible to mistake for anything else. It is DEFINITELY a yukata, not a yukata trying to disguise itself as something more formal. All the non-yukata cotton kimono I own are patterned like komon. I don't think a cotton kimono or yukata, even with houmongi patterning, is trying to be a houmongi so much as trying to be a more elegant version of an inherently informal type of garment. I think basically you could say there are two types of yukata. One type is the type you normally wear and has the repeating pattern. 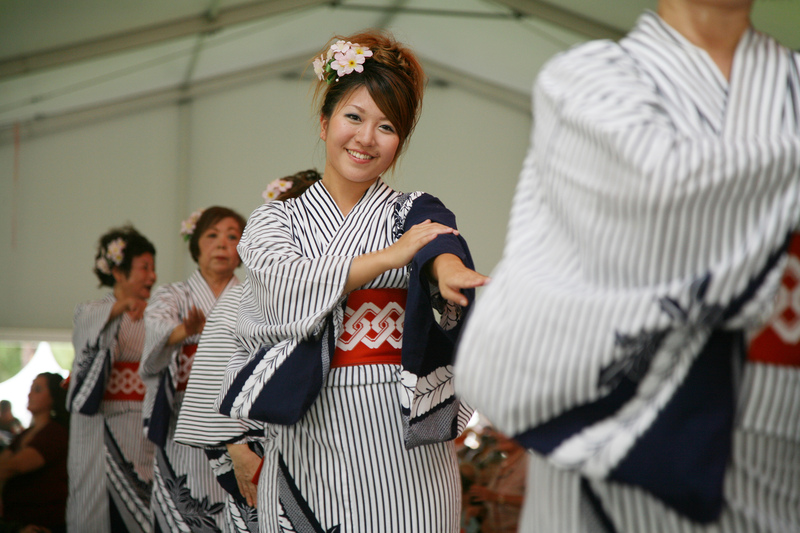 The other type is patterned like a houmongi, but (as far as I have deduced) is mostly worn when performing/dancing. Thank you for the help! I appreciate it a lot! I had been looking up pictures of yukatas to get an idea of the norm as far as designs go, and I only seem to find repeating patterns. But if I ever get around to making my own yukata, I would love it to have a hōmongi-like pattern, because they are usually my favorite! But I didn't want to bend the rules of yukatas TOO much, especially since I live in Japan! One thing about the "houmongi style" patterns on yukata, they are in a specific style, usually single or maybe dual colour on white designs. And quite stylistic. Patterns do not cary any semblance to those on houmongi style kimono. I therefore would not make the design too intricate or elaborate, especially if you live in Japan. But your right, even when I was buying my kimono bolt to be sent off and made, I noticed an adorable cat obi and even a Christmas obi in the kimono store. So it's entirely possible kimonos are being allowed a bit more freedom in design these days. I can't help wondering if they are trying to appeal to younger people since western dresses are more trendy and popular over kimonos unfortunetly.